“Georgia Organics is a member supported, non-profit organization connecting organic food from Georgia farms to Georgia families. We believe food should be community-based, not commodity-based. The task: creating a daily food safety record keeping system for organic farmers. Billy Mitchell from the Global Growers Network reached out to Streetcat asking for advice on creating a system where farmers would be able to better manage their information when it came to food safety procedures in organic farming. 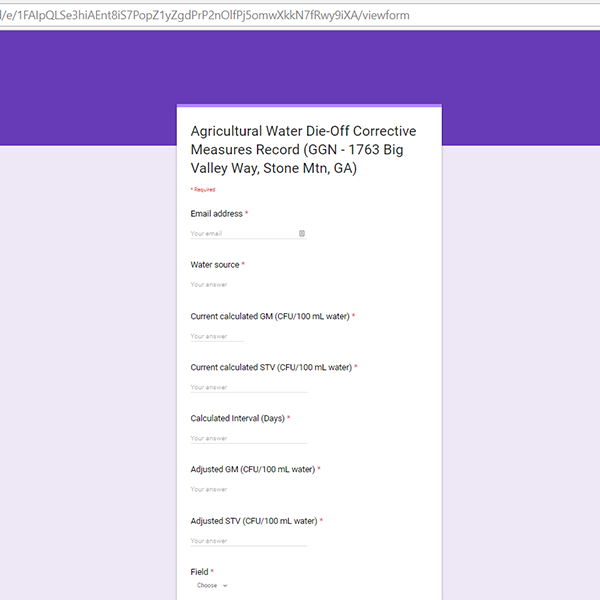 Having worked with Google Apps before and knowing the ubiquity of their usage among most Internet users, Streetcat prototyped a record keeping model by translating the paper form of daily food safety records into individual Google Forms that farmers would fill out each day. The daily submissions from farmers would be recorded into a massive, searchable spreadsheet where the farmer would easily be able to pull up a specific record during a federal audit. The plan was to make a series of easy to answer record forms that were searchable for later inspection. Georgia Organics was happy with the end result and have been rolling these forms out to farmers to use for maintaining their food safety records on a day to day basis.